In an emergency such as flooding, wildfire or a noxious gas leak, emergency officials do their very best to communicate with residents quickly, but message fan-outs and door-knocks can take precious time and resources. In the first hours, only the most at-risk may be contacted, while others may not be aware of the local emergency, or anxiously searching for direction. Residents with impaired mobility, sight or hearing may feel more vulnerable as they await news. So, how would we warn you? The Village of Keremeos has recently subscribed to a Resident Notification System that will allow us to simultaneously text, email and voice message all residents in the community, alerting citizens to an imminent threat at the earliest possible time, and then echoing up-to-the-minute instructions from emergency responders. 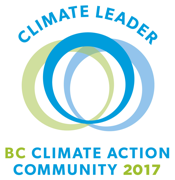 We urge all residents within Keremeos to sign up for the notifications! 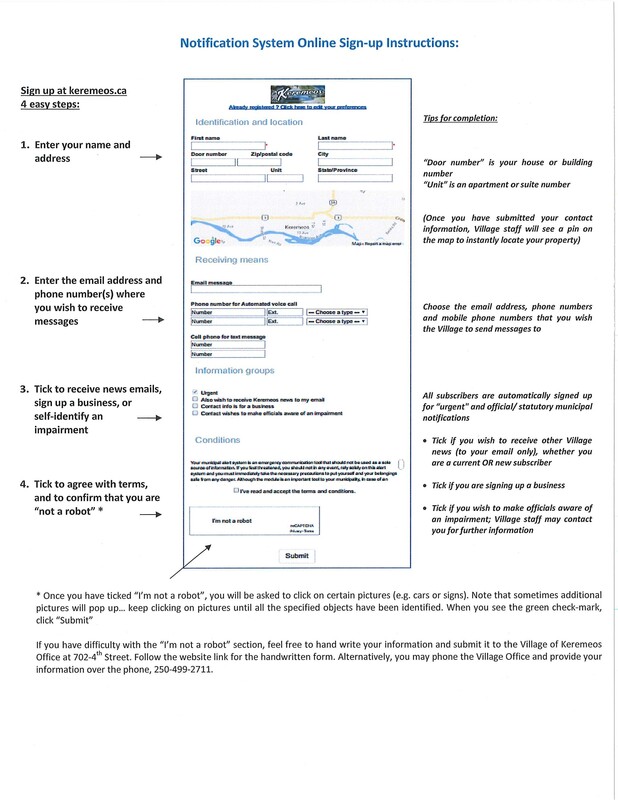 Residents who are currently subscribed to receive the Village news updates via email should sign up through the new system to receive emergency notifications as well, and tick the “Also wish to receive Keremeos news to my email” box to continue receiving news emails. The notification system has more uses than keeping residents informed in a major emergency…. 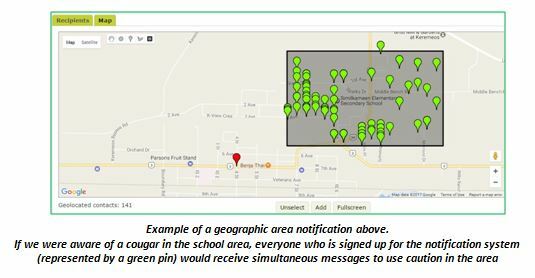 The system enables Village staff to simply draw around a geographic area on the map, and then simultaneously message all residents in the area within minutes. Help us keep the emergency contact numbers up to date! Go to the Notification System page at keremeos.ca and click on “Already registered? at the top of the sign-up form. The link will walk you through how to update your information. If you prefer, the Village Office staff would be pleased to update your information. Please spread the word, and urge newcomers to Keremeos to sign up for the notification system!